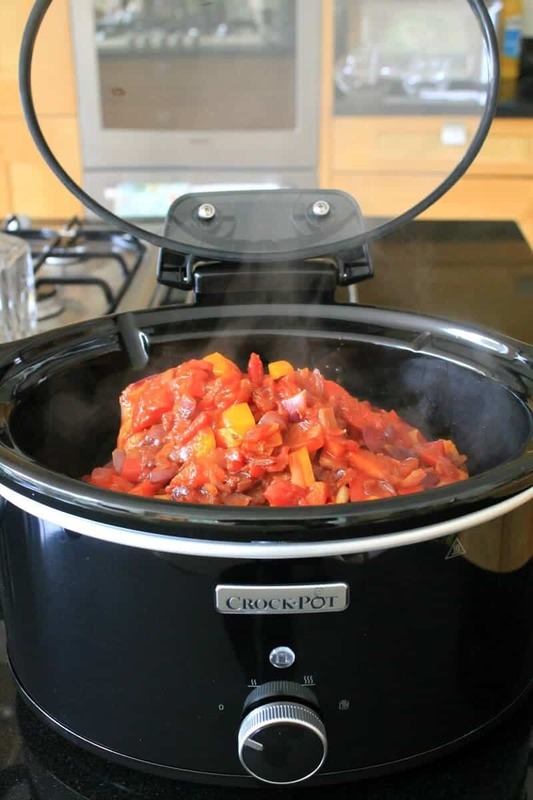 This month Crock-Pot UK challenged me to try out one of their recipes in a new hinged lid slow cooker and see how I got on with it. As it is October this marks the start of slow cooker season, also known as Crocktober, when we all start using the slow cooker a lot more than ever. 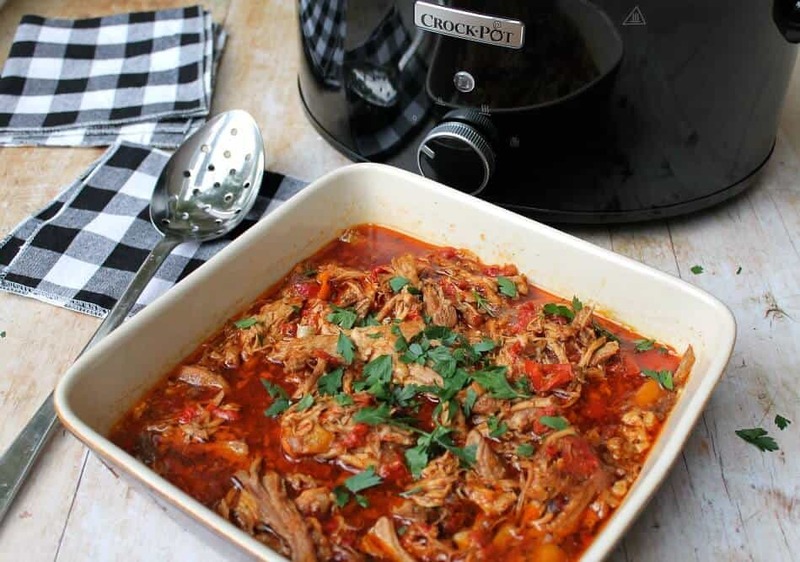 I’m sharing how I got on making the Crock-Pot recipe for slow cooker paprika pork goulash. 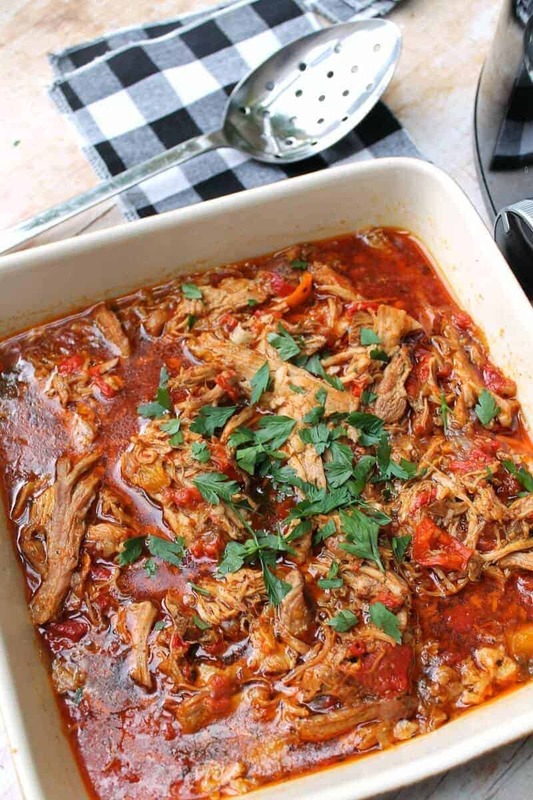 This recipe is very interesting as it is made using a joint of pork, the same kind you would use to make pulled pork. You cook the pork whole and then shred it and serve it in the sauce, so this is a pulled pork goulash dish. I loved the way this was made as it is so different. The first step is to brown off the pork and add it to the slow cooker. The hinged lid is brilliant because it is out of the way and doesn’t cause those wet circles you get on the worktop when using a normal lidded slow cooker. Plus the lid isn’t going to get knocked off and smashed during cooking, which has happened to me before and is the most annoying thing ever. Next make the sauce in a pan. 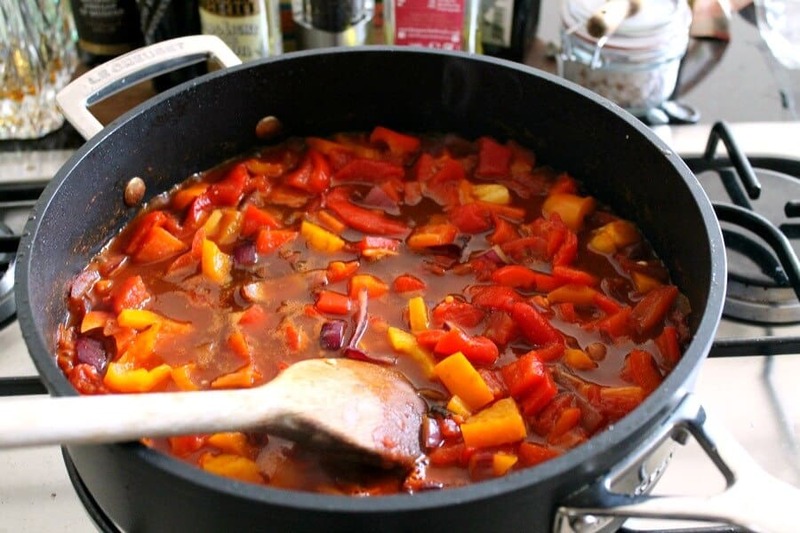 Red and yellow peppers and paprika give this sauce a really vibrant colour even when you just start cooking it. Once the sauce has cooked for ten minutes, you are ready to pour it into the slow cooker over the meat. Then you are free to leave it to cook and go and get on with work, chores, a day out, whatever you have planned for the day. Return later in the day and your food is ready. 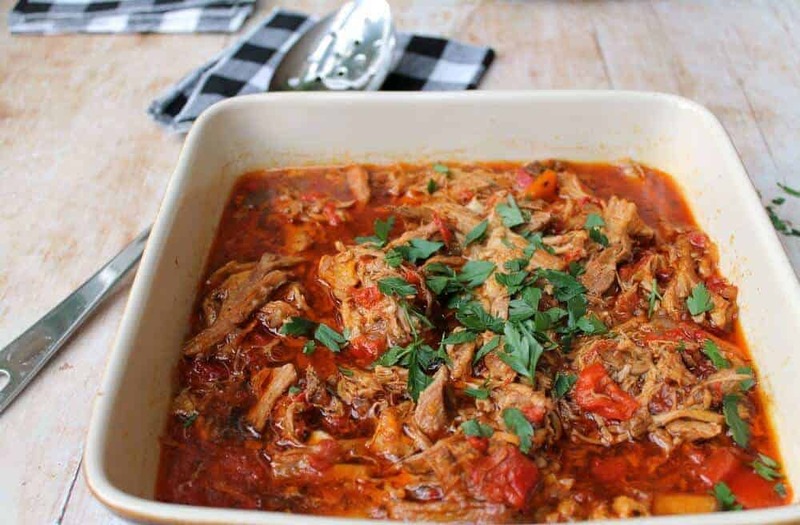 You’ll just need to shred the meat, stir it back into the sauce, and prepare the side dish you are serving the paprika pork goulash with. We liked both pasta and rice with this dish, we tried both as we had plenty of goulash to last over several days. Finally, when served, this is a rich and flavourful dish which my whole family enjoyed, even the children. I had several remarks about how tasty they found this, so I’ll definitely be making it again. The deep rich colour of the sauce is a hint at the great flavour from the paprika and peppers which combine with great results during the slow cooking process. A handful of chopped parsley to serve really sets this off and lifts the flavour too. Whether served with pasta or rice this is a great mid-week meal option and would also work as a special dish to enjoy at the weekend. 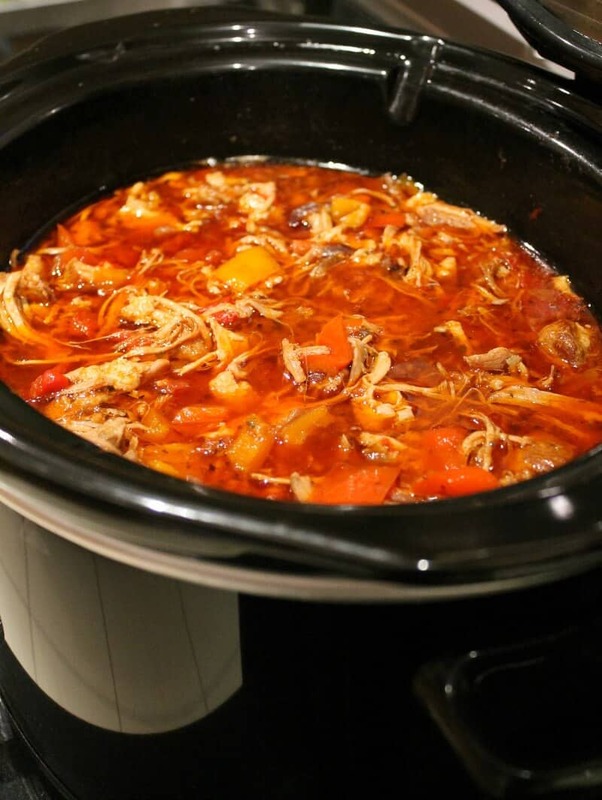 Get the recipe below and if you would like a hinged slow cooker for yourself, you can get the 5.7 litre one I used to make this dish here from the Crock-Pot website. Disclosure: This post is sponsored by Crock-Pot UK. Score the fat on the pork in a criss-cross pattern all the way through to the meat, then season generously with salt and pepper. Add a splash of oil to a suitable sized frying pan and brown the pork on all sides, place into your Crock-Pot bowl. Add the onions, chilli, paprika, caraway seeds, marjoram or oregano to the frying pan and cook gently for approx 10 mins. Add the sliced peppers, the grilled peppers, the tomatoes, vinegar and stock, stir well then pour the mixture over the pork. Cook on Low for 6-7 hours or High for 5-6 hours. You’ll know when the meat is cooked as it will be tender and it will break up easily when pulled apart with two forks. Stir the soured cream, lemon zest and most of the parsley together in a little bowl. When the meat is done, tear or break the meat up and serve the goulash in a big dish or bowl, serve with some steamed rice and your flavoured soured cream. Sprinkle with the rest of the chopped parsley and serve. So good! I served it over white sticky rice. I would definitely recommend this dish! Thanks I couldn’t believe how much everybody loved this! This goulash looks seriously tempting and just perfect for this time of year. Definitely one to bookmark! ooh I like the look of that hinged lid, so clever! Your Goulash looks delicious, one to bookmark for sure! 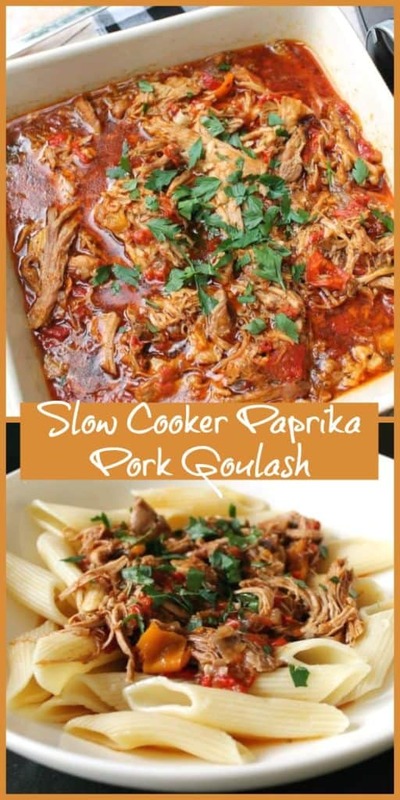 I love a good slow cooker recipe! My husband would absolutely adore this. 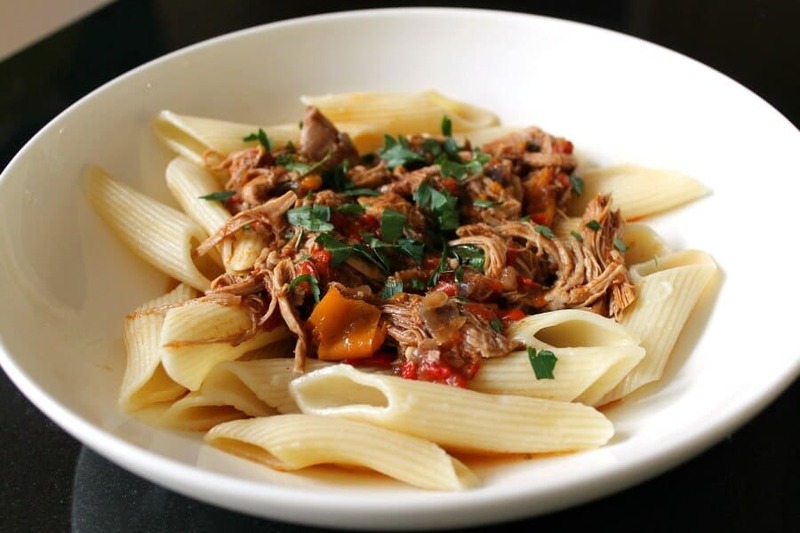 Your slow cooker recipes are fab Becca! I like your thinking Emily – chunky bread dipped in the sauce would be lovely. It was my kids who requested pasta – pasta with everything LOL! 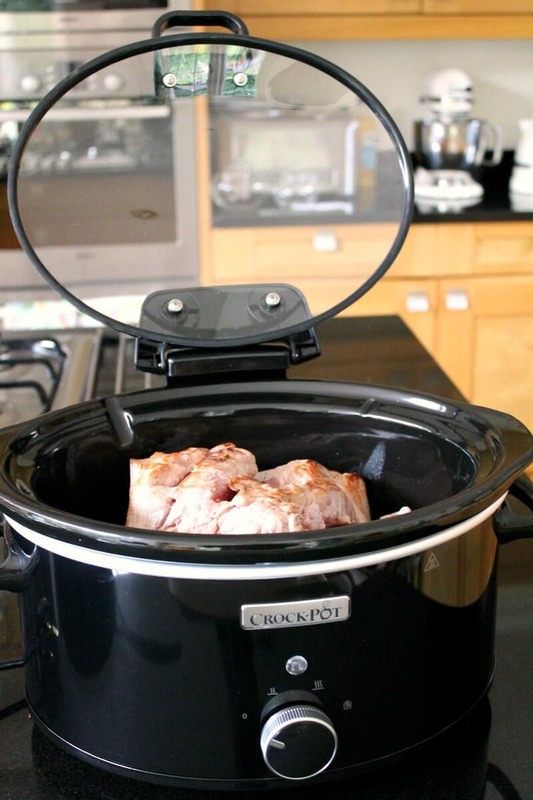 What a fab crockpot, I’m very jealous! This recipe looks delicious too! Thanks Alex, the crockpot is great especially the hinged lid!